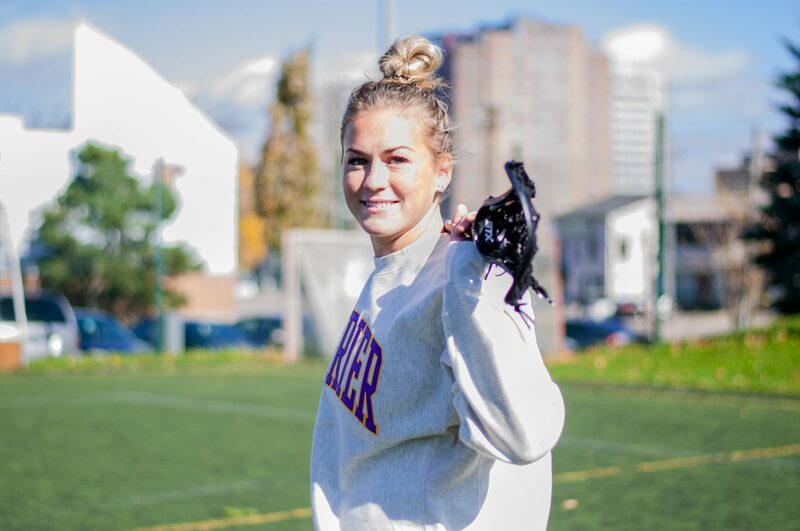 The women’s lacrosse team has been one of Laurier’s most successful varsity teams this year. Boasting an overall record of 11-2, the Hawks clinched the number two seed in the OUA standings this past weekend as they get ready for the playoffs. One of the key cogs behind their outstanding performance this season has been the play of Rose Williams. The third year attacker has been on fire for the Hawks, scoring bundles of goals game after game. Williams recently discussed the reasoning behind her improved level of play, giving a lot of the credit to her teammates. “I think my performances getting better has to do with the entire team. We’ve really raised our level of play and competition over the years. In [my] first year, we still really took the team seriously, but as we’ve moved on in years, we’ve come to take ourselves more seriously and put the team first,” she said. The Elora, Ont. native started her Laurier career strong two years ago, winning Team Rookie of the Year honours. Now in her third season with the team, Williams has become a leader on an extremely talented squad. “I do feel a responsibility to pump up the younger players and get their confidence up and I think that’s really helping the younger players to produce this year just as much as the seniors are,” she said. Now that the regular season has finished, the games are only going to get tougher for the purple and gold. The Hawks ended the regular season with a loss against the undefeated Queens Gaels: the same team that knocked them out of the playoffs last year. Williams and her teammates know that the road to the OUA championship is likely going to go through Queens again this year. “We have for sure been thinking about it. Even before the game against Queens, we were thinking that we are likely going to play them again at some point, so we don’t want to show them everything that we have. But in both the games we’ve lost this season, we have walked away afterwards saying ‘we know we can beat this team,’” she said. The last OUA championship for the Golden Hawks lacrosse team came all the way back in 2010. But with the talent, depth and leadership on this team, it would be far from a surprise to see the 2018 Hawks finally end that drought. “When I came into the team in my first year, I didn’t know too much about the team and the history. Obviously I know now we had a ton of success years before I had come. We only lost a few players from last year and we were very successful last year. So with the depth we have on the team this year, we have a very good shot of winning it all this year. We need to bring that confidence into next weekend,” Williams concluded.